Shadow banking has grown even more rapidly than the official banking sector in the international world Since the 1980s. It grew in size dramatically after the year 2000 and plays an increasingly critical role in lending businesses through credit intermediation. Many “shadow bank” like institutions and vehicles have emerged in American and European markets, between the years 2000 and 2008, and have come to play an important role in providing credit across the global financial system. In the US, shadow banking system was approximately the same size as the U.S. traditional depository banking system. This phenomenon is not just confined to the West. It is visible in Latin America, the Middle East, Far East, South Asia, and Eastern Europe. It has become a critical part of the infrastructure of the modern financial system. Shadow banking was first used by Paul McCulley of PIMCO in 2007 to describe the giant “soup” of non-depository institutions. It was later popularized by economists such as Nouriel Roubini in 2008 to include all forms of financial institutions like hedge funds, insurance companies, and investment banks. As they are not supposed to accept deposits from the public and are not subjected to regulations, they are called shadow institutions. Familiar examples of shadow institutions included Bear Stearns and Lehman Brothers. McCulley defined it as “the whole alphabet soup of levered up non-bank investment conduits, vehicles, and structure where traditional banks get their funding via short-term loans in what is called the “repo market”(short for “repurchase agreement”). There are large number of intermediaries between investors and borrowers. These intermediaries will channel funds from investor to the borrower, profiting normally from fees. Like the traditional banking system, the shadow banking system has three actors: savers, borrowers, and—instead of banks—specialist non-bank financial intermediaries. The regulatory structure of this system is light or non-existent. Unlike in the traditional banking system, savers do not place their funds with banks, but rather with money market mutual funds and similar funds. They in turn invest these funds in the liabilities of shadow banks. Borrowers still get loans, leases and mortgages, but not only from depository institutions, but also from entities like finance companies. Faced by competition from junk bonds and commercial paper on the asset side of bank balance sheets and from money-market-mutual funds on the liability side, commercial banks became less profitable and sought new profit opportunities. Commercial banks, subject to prudential regulation and to mounting competition, greatly increased the amount of credit available. In order to do so, they had to move part of the assets (and therefore of the risks) off their balance sheets, given that their capital was insufficient to meet the requirements established by Basel Agreements. Gradually, banks started managing investment funds, as well as offering services of asset management through their departments, providing hedge as dealers on the derivatives market and offering credit lines through issues of commercial papers and other debt bonds on the capital market. A large variety of institutions came to play a role similar to those of commercial banks without being included in the existing regulatory structure and therefore without detaining the required reserves of capital. They created and spread credit derivatives (CDS), through which they could buy protection against the credit risks of their loan portfolios. They also resorted to the so-called “structured products”, instruments which result from the combination of a credit bond – debentures, bonuses, negotiable bonds, mortgages, credit card debts, etc. – and the set of financial derivatives (futures, swaps, options and credit derivatives), no matter what the underlying asset is. As mentioned earlier, it encompasses large independent investment banks (brokers-dealers), hedge funds, investment funds, private equity funds, the different special investment vehicles (particularly structured investment vehicle- SIV), pension funds and insurance companies. In the US, one must further include the regional banks specialized in mortgage credit and quasi-public agencies, created with the purpose of providing liquidity for the US real estate market. They can be broadly categorized into three distinct subgroups. These are: (1) the government-sponsored shadow banking sub-system; (2) the “internal” shadow banking sub-system; and (3) the “external” shadow banking sub-system. The change in the nature of banking was initially “inspired” by the securitization process of conforming mortgages. It was extended to virtually all forms of loans and “perfected” into a securitization-based, shadow credit intermediation process over time. This is how “internal” shadow banking sub-system developed. The mixture of bank and markets-based credit intermediation process also turned a range of independent, specialist non-banks into an interconnected network of financial entities that operated completely external to banks and the official safety net extended to banks—hence the term “external” shadow banking sub-system. Huge Investment Banks like Lehman Brothers started doing banking activities indirectly by buying housing loans and persuading the mortgage banks to lend more to borrowers for the purchase of house. Investment banks multiplied the hedge funds and assets of greater risk set up highly leveraged structures. Similarly, universal banks also started sponsoring hedge funds, providing them with credit for their operations as well as copying their business strategies. The role of the hedge funds is crucial, since they appear at different ends of the leveraging and distribution of financial assets. Furthermore, they are the most difficult agents to be put under the control of the regulatory framework of central banks. In other words, the hedge funds are the least regulated (and thus more shadowy) agents, at the same time as they closely depend on bank liquidity and contribute to increase systemic risk. The process through which banks “recycle” savers’ deposits into loans is referred to as credit intermediation. Credit intermediation involves credit, maturity, and liquidity transformation. Credit transformation refers to the enhancement of the credit quality of debt issued by the intermediary through the use of priority of claims. For example, the credit quality of senior deposits is better than the credit quality of the underlying loan portfolio due to the presence of junior equity. Maturity transformation refers to the use of short-term deposits to fund long-term loans, which creates liquidity for the saver but exposes the intermediary to rollover and duration risks. Liquidity transformation refers to the use of liquid instruments to fund illiquid assets. For example, a pool of illiquid whole loans might trade at a lower price than a liquid rated security secured by the same loan pool, as certification by a credible rating agency would reduce information asymmetries between borrowers and savers. The funding methods followed by shadow banks are of three types. They are: money-market-mutual funds (MMMFs), securitization, and repo. MMMFs were a response to interest-rate ceilings on demand deposits. Securitization refers to the process by which traditionally illiquid loans are sold into the capital markets. This is accomplished by selling large portfolios of loans to special purpose vehicles (SPVs), legal entities that issue rated securities in the capital markets, securities that are linked to the loan portfolios. Securitsation through SPV and repo are considered as the two major activities and they are taking place through credit intermediation. European banks involved in shadow credit intermediation were dominated by German Landesbanks. Banks from all major European economies and Japan were active investors. 20 European banks’ and other banks’ and nonbanks’ involvement in shadow credit intermediation activities. The shadow banks do not have to keep as much money in the proverbial vault relative to what they borrow and lend and hence a high ratio of debt relative to the liquid assets available to pay immediate claims, technical called (high) financial leverage . The liabilities of European banks’ shadow banking activities were not insured explicitly only implicitly. In technical terms, these institutions are subject to market risk, credit risk and especially liquidity risk, since their liabilities are short-term while their assets are more long term and illiquid. Shadow banking played a key role in the financial tsunami that struck the global economy in 2008. In early 2010 economic activities of the PIGS (a group of 4 nations in Europe namely Portugal, Italy, Greece and Spain) have come under increased scrutiny from the international investment community, with the threat of ‘Sovereign default´ lurking around the corner. This is the first eurozone crisis since its creation in 1999. To tackle the crisis many governments were forced to borrow heavily consequently generating high fiscal deficits. Later the policy reversed and adopted tighter fiscal policy. The negative impact of tighter fiscal policy could offset the positive impact of lower borrowing costs. This social disruption could have a significantly negative impact on investment and growth in the longer term. The crisis is still going on. Asset Finance Company : a company carrying on as its principal business the financing physical assets supporting productive/economic activity: autos, tractors, material handling equipments. Loan Company: a company carrying on as its principal business the providing of finance whether by making loans or advances or otherwise for any activity other than its own. Investment Company: a company carrying on as its principal business the acquisition of securities. Core Investment Company: an investment company whose 90% of Net Assets in equity shares, preferred shares, bonds or loans of a group of companies or 60% of Net Assets in equity shares of a group of companies. Infrastructure Finance Company: a company which deploys at least 75 per cent of its total assets in infrastructure loans. It must be noted that the growth of NBFCs is noticeable in recent years in India. It is found that they are accepting deposits but RBI regulation restricts it. However, credit activities have gone up (as a percentage of bank credit it is 13.2 % in 2011 as against 10.77% in 2006).With increased global integration, the Indian economy now is subject to greater influence of global business cycles. Still, shadow banking is currently not a threat to the economy but an increasing concern. It will create problems unless it is properly checked. Guarantees,” Journal of Banking and Finance 1, pp. 3-11. Carnegie-Rochester Conference Series on Public Policy, 38 (1993) 1-34. 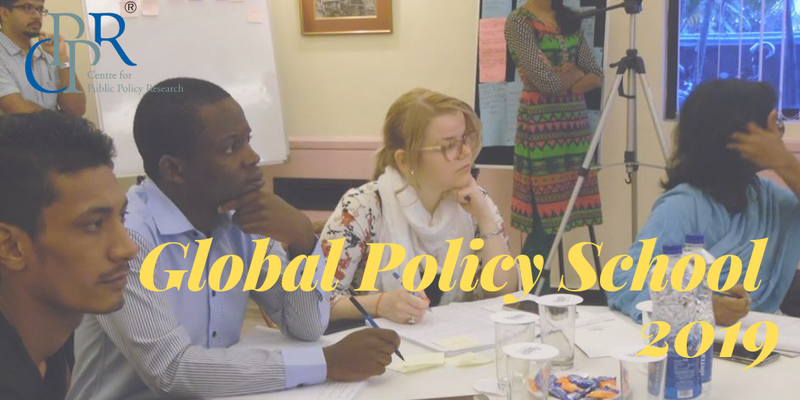 Centre for Public Policy Research (CPPR) is a think tank dedicated to extensive and in-depth research on current economic, social and political issues. © 2018 CPPR. All rights reserved. Web Design Powered by BJ Corps.